Clarks Shoes Size 11 mens extra wide. Clarks Shoes Size 11 mens extra wide.. Condition is New with box. Dispatched with Royal Mail 2nd Class. Nice shoes never been worn tried on a few times. UK Size 7. Condition is Used. A Pre Owned Pair Of Shoes With Light Signs Of Wear. Plenty Of Life Left In Them. 12 PHOTOS ! GORGEOUS CLARKS SHOES. SIZE 8. LEATHER. BROWN, TAN IN COLOUR. MOCCASIN LACE UP STYLE. REALLY GOOD CONDITION REALLY NICE. THANK YOU FOR LOOKING. STYLE TORCOURT SUPER NAVY. COLOUR NAVY. SIZE UK 12 / EU 47. UPPER LEATHER. LINING LEATHER. 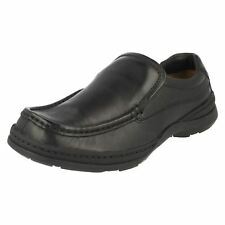 Casual leather slip-on shoe,by Clarks,bought two years ago,& worn only once,have lain in cupboard since.Soft leather uppers,very well ventilated with cut-outs & elasticated side panels for comfy fit.Clarks insole,cushy & very comfortable. STYLE WALLABEE BROWN LEATHER. SIZE UK 10.5 / EU 45. UPPER LEATHER. LINING LEATHER. Clarks Reazor Edge. Sage nubuck. Genuine CLARKS. Grab a bargain! SIZE: 11 UK, 46 EU. Upper premium leather. For international orders use similar service with signature request only. Less than 50% of RRP . CONDITION: Very good. (CAN BE WORN AS SLIPPERS). BROWN LEATHER UPPER WITH LEATHER LACES. (LARGE RUBBER PADS SET ON LEATHER SOLE). RUBBER AND LEATHER SOLE. LEATHER LINING. This is a lovely pair of 100% brown leather slip on shoes by Clarks. Grab a bargain. They are brown leather and are moccas in/brogue style shoes. They are a UK size 8.5 but are a small 8 and a narrow fitting. Clarks Brown Waxy Leather Moccasin Deck shoes Mens UK 8 Excellent Condition . Condition is Used. Timberland quality. Dispatched with Royal Mail 2nd Class. Nice gents Goretex leather moccasins by Clarks,in good condition,only had very light use. Perfect shoe for our wet climate,great for work/office, or just general wear. Top quality, without the top price,grab a bargain at less than 1/2 of the price new.